Today I visited western Tokyo, after being away in the Kansai region for the past week. 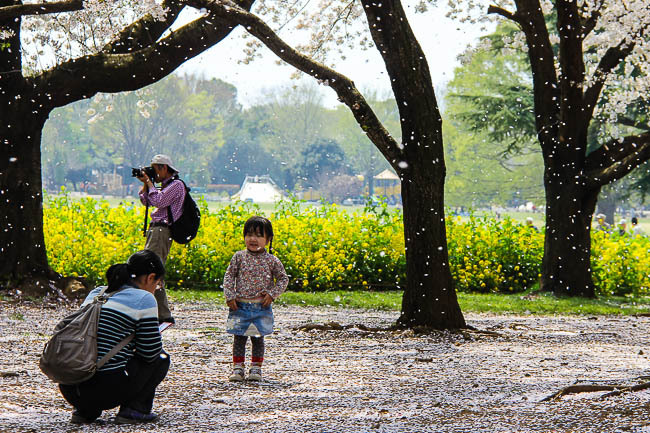 Petals are starting to fall in Kyoto as Sean reported here. 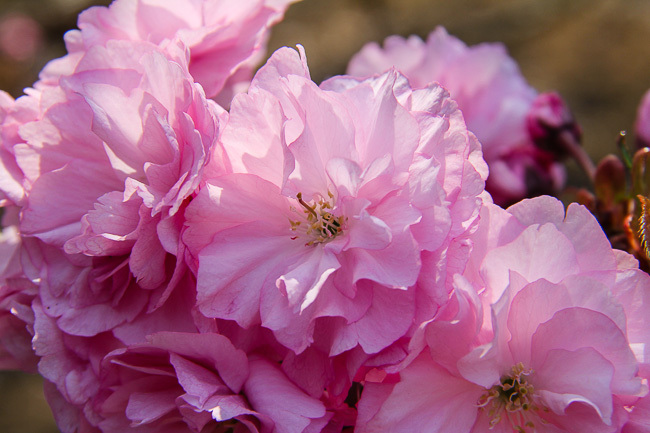 And in central Tokyo, Scott also reported three days ago that petals of the Somei Yoshino variety are falling freely. 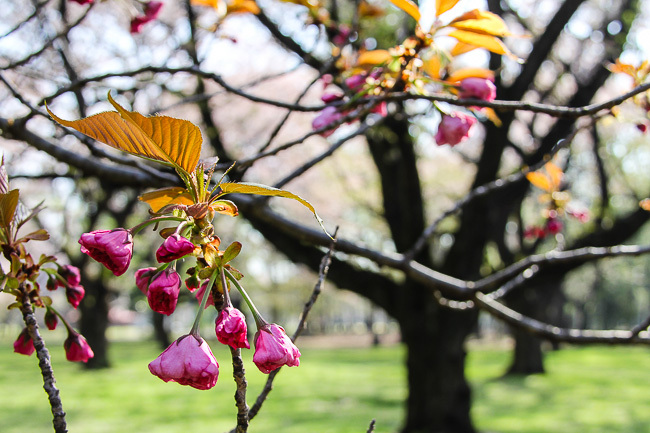 However in two of the places I visited today, Koganei Park and Showa Kinen Park, the cherry blossom season is a little later than in central Tokyo. 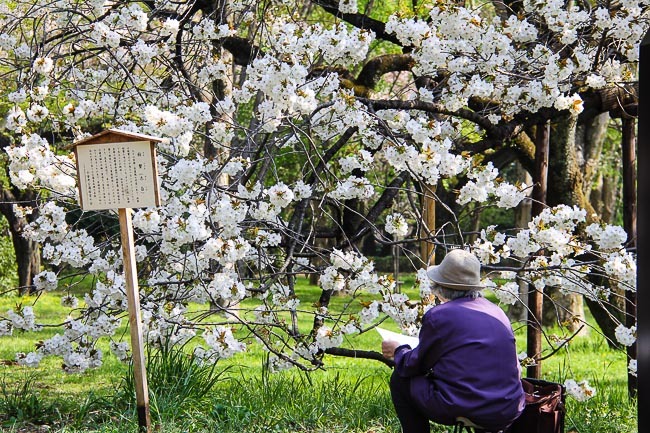 In Shinjuku Gyoen, while the Somei Yoshino variety's season is over, late blooming cherry blossom varieties can still be seen. 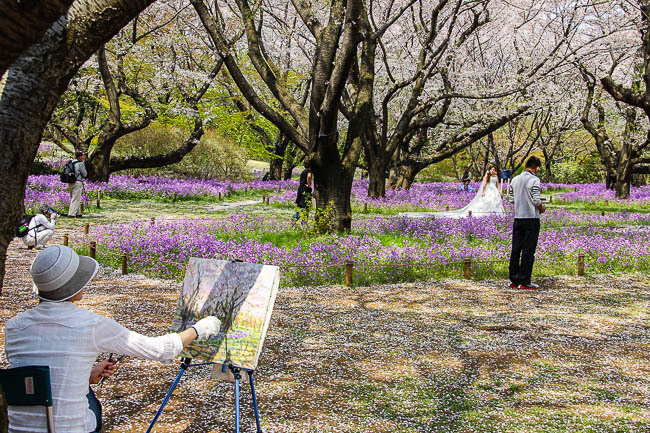 My Tokyo wedding photo-shoot stands at two today, trailing behind Kyoto. 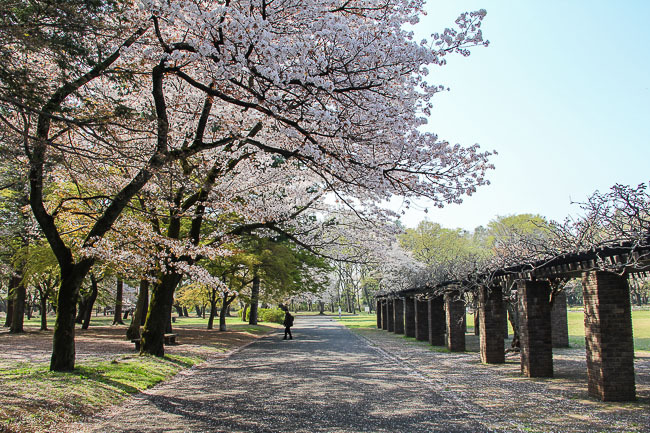 Koganei Park is the second largest park in the Tokyo metropolitan area and was opened in 1954. 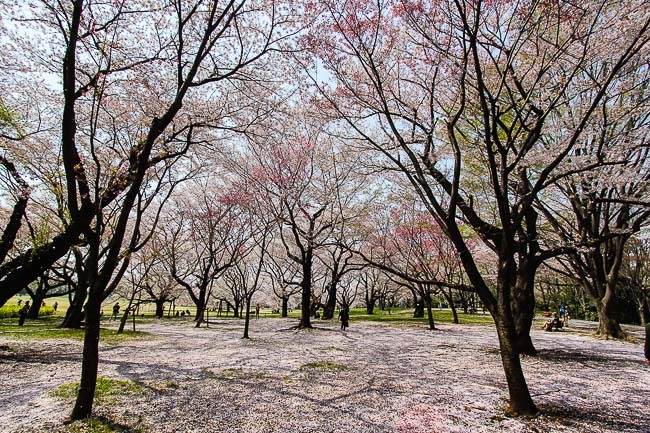 There are about 2000 cherry trees, and about 50 different varieties of cherry trees planted in the garden, making it a beautiful spot to view cherry blossoms. The nearest station closest to the park is Musashi-Koganei Station, 30 minutes on the JR Chuo Line from Shinjuku Station. From Musashi-Koganei Station, it is another 15 minute walk or a 5 minute bus ride from the station. The Edo-Tokyo Open Air Architectural Museum is also located in the park. I arrived at Koganei Park in the morning and was joined by the other early birds who were exercising or walking their dogs. 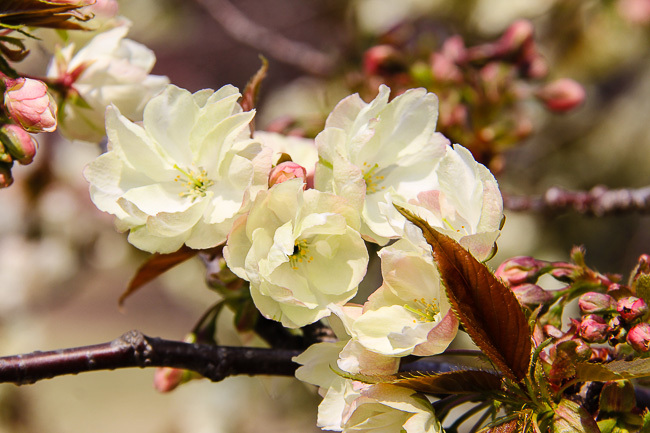 The petals of the Somei Yoshino variety were falling freely at the slightest breeze, however, the later blooming cherry trees were just opened. 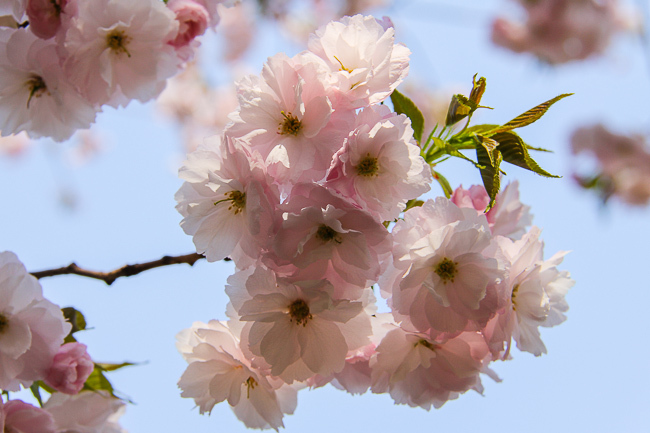 With the warm weather forecast for the next few days, this weekend should be a good time to see the later flowering cherry blossoms as well as the last of the Somei Yoshino blossoms. 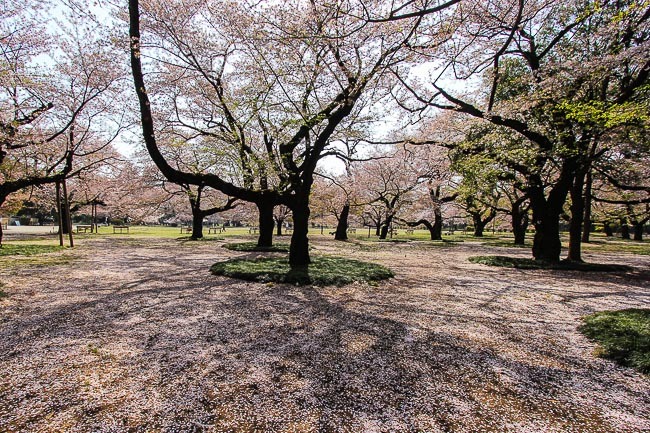 One of seventeen national government parks in Japan, Showa Kinen Park was opened in 1983. 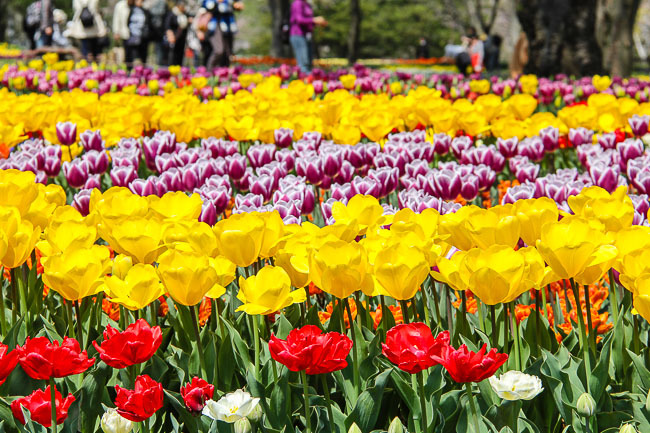 It was established to commemorate the 50th anniversary of Emperor Showa's reign. The closest train station to one of the park's entrances is Nishi-Tachikawa Station on the JR Ome Line. Entry into the park costs 410 yen. There is also a 14 kilometer cycling course and there are bicycles available for rent. Another option of getting around the sprawling park is to take the internal park train. 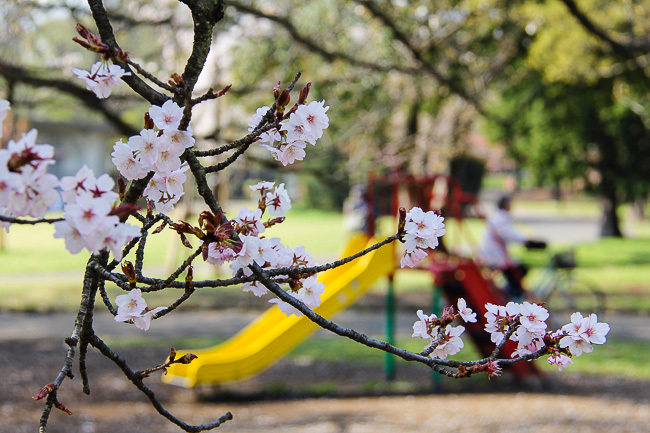 My next stop was Showa Kinen Park, and I arrived to find the entrance crowded with visitors. 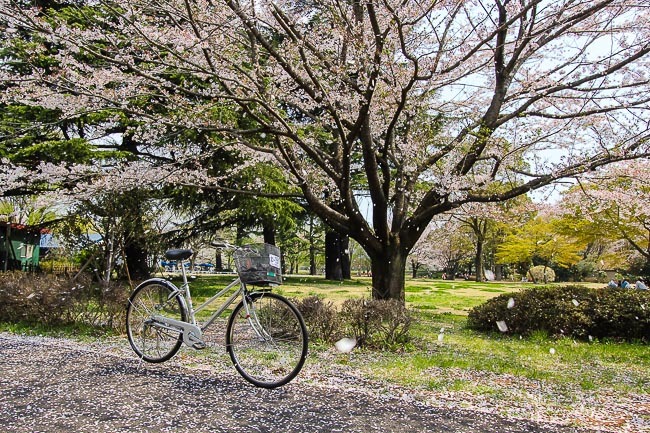 I rented a bicycle to get around the park and found it to be good idea. With designated bike parking areas around the park, I found it easy to stop and explore areas of interest on foot. 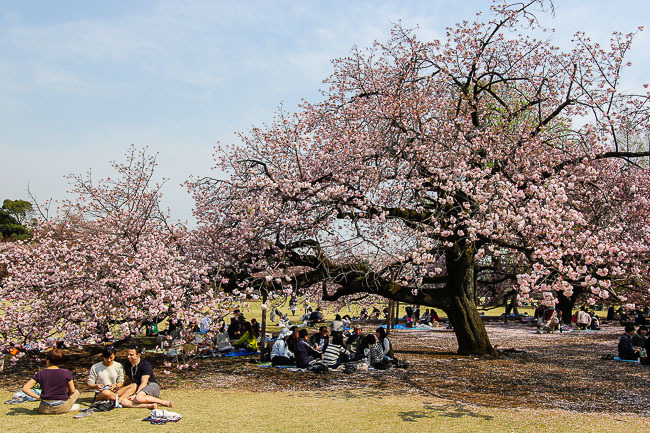 The cherry tree garden in the middle of the park was most crowded with people picnicking and photography enthusiasts. 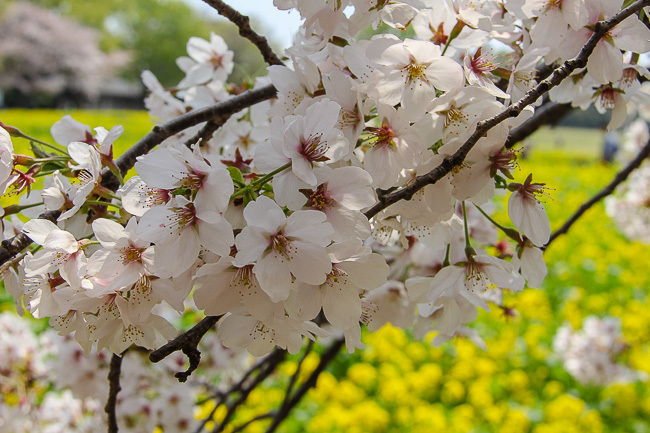 It was not difficult to see why as there were many cherry trees as well as a large patch of nanohana flowers in bloom. There was also a huge field in front of the cherry tree garden and I saw some elderly men flying gilders and children running around. 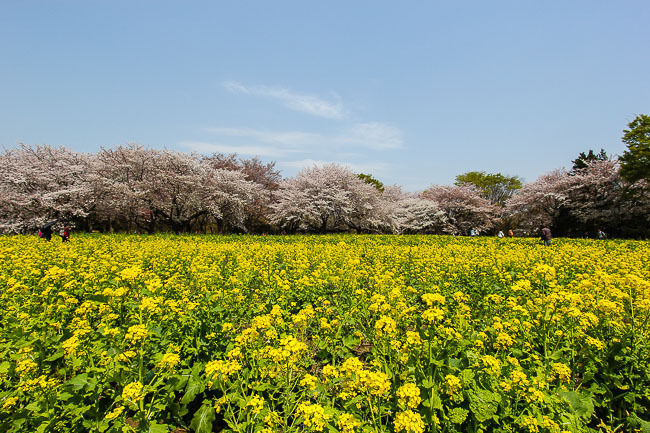 Showa Kinen Park looked great for a family day out and with the current weather forecast, the cherry blossoms should last till this weekend with lots of opportunities to see petal blizzards (hanafubuki). My last stop for today was Shinjuku Gyoen. 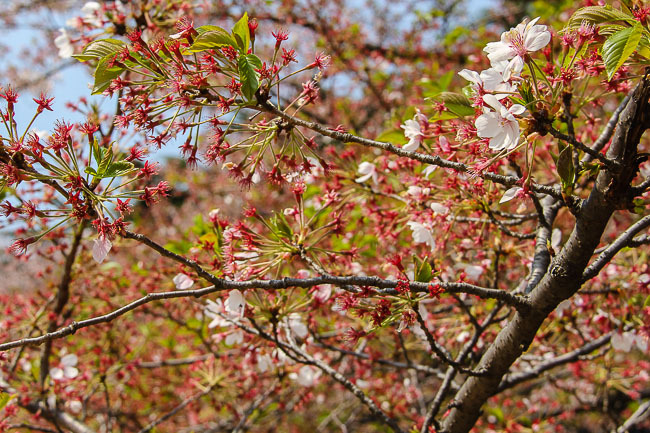 Even though the season for Somei Yoshino blossoms here is over, fret not. 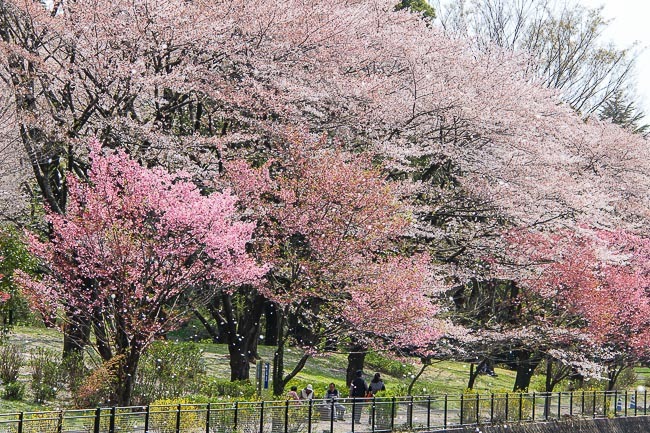 Visitors to Shinjuku Gyoen can still see some of the later blooming cherry trees that were approaching full bloom. 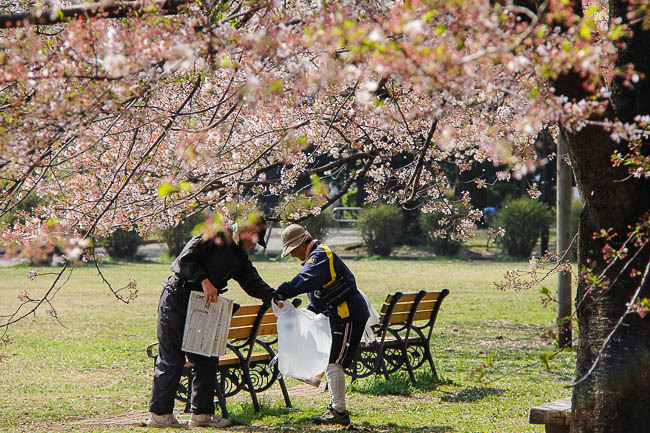 I saw many people picnicking under the later blooming cherry trees, and the Somei Yoshino trees despite their lack of blossoms. Some people were even taking siestas in the shade of the trees. What a great way to spend a Thursday afternoon. 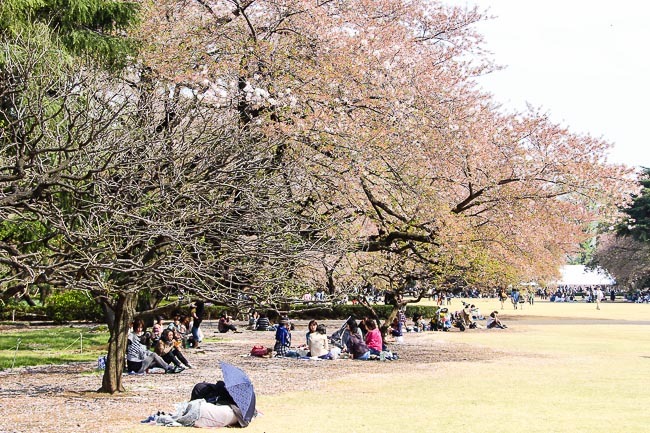 As with the other two sites, Shinjuku Gyoen would still be perfect for cherry blossom viewing parties this weekend as the later blooming varieties should reach full bloom within the next few days.